Yellowstone National Park has two large backcountry geyser basins, at Shoshone Lake which has nearly 500 active features, and at Heart Lake, just a little smaller with 390 - mostly just pools and vents of many different colors and forms, but also several proper geysers. The main spouter is Rustic Geyser, located at the far side of the basin beneath the reddish slopes of Mount Sheridan, and 7.5 miles from the nearest highway (the Grand Loop Road between the South Entrance and Grant Village). The basin may be reached by a long trail that passes through rather featureless forest for four miles then follows the valley of Witch Creek for the next three, along which are found the thermal pools, though the majority are a little way off the path. 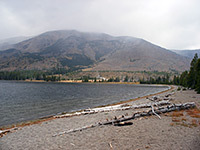 At the far side of the basin, the trail arrives at a beach by the edge of Heart Lake, and divides; the two branches circle most of the way round the shoreline and link with other paths, to the Snake River, the southeast arm of Yellowstone Lake and the summit of Mount Sheridan. 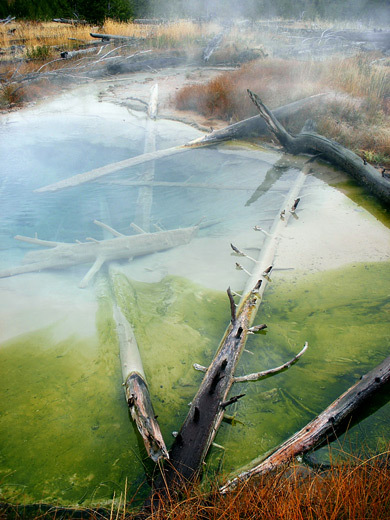 28 views of Heart Lake Geyser Basin. 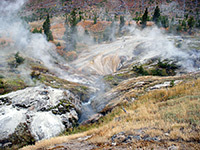 Panorama of the Rustic Geyser area. Full screen version (13 mb). Rustic Geyser (mp4; 2:24 min; 19 mb). The Heart Lake trailhead is at a clearing in the woods at the end of a short track that forks off the main road 5 miles south of Grant Village, and just north of Lewis Lake. It has plenty of parking space, rest rooms, a trail map, and an information board about back country travel and the danger of bear encounters, which are quite frequent in this area. Because of bear activity, the trail is closed from April 1 to June 30 each year. The path stays almost level for a mile or so through meadows and lodgepole pine woods, and is soon running alongside a small, rocky ravine. The route starts to climb steadily but still fairly gradually up to the top of a low plateau at elevation 8,130 feet, the highest point on the journey. During the ascent Factory Hill comes gradually into view to the right (south), though the scenery is otherwise limited to the never-ending trees. The forest was all damaged in the 1988 wildfires and now contains just a few isolated clusters of old pines, the rest being new, mixed with dead trunks in various stages of decay. There are several larger meadows and dry streambeds but not much else to see for 4 miles, until the path nears the upper end of Witch Creek. While bears may be spotted in early summer, and wolves also inhabit the woods, deer are usually the only wildlife in evidence. As the path emerges from the forest into the head of the valley, it passes right by a small thermal area, and steam plumes in the distance reveal the location of many more. 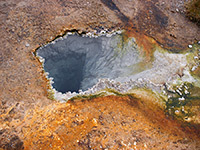 The initial group includes a cream-colored mud pot and a dozen or so small vents, either with or without water, some tinged deep red by deposited sulfur. Several other minor active regions are encountered further downhill including one where the path goes right across a bleached white patch and although there is no spring nearby, heat from below is noticeable when walking across. There are numerous similar patches of bare earth in the vicinity, quite far from any recognized thermal feature yet still warm to the touch - just enough heat reaches the surface to prevent grass growing. As most of the features in the upper part of the basin are away from the path (up to a third of a mile away), they can only be seen by off-trail hiking, bearing in mind the standard warnings about exploring such areas. 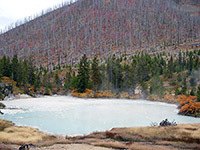 At the far west edge are a number of big pools of differing colors and activity (the Upper Group), including the largest in the whole valley - a simmering pond 120 feet across filled with cloudy, turquoise water. 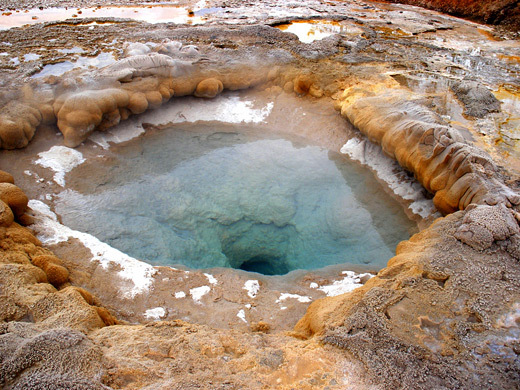 Nearby is the one main geyser hereabouts (Deluge Geyser), though this erupts infrequently and for most of the time is just a calm pool of hot water, contained within a ring of pretty, bulbous sinter formations. Nearby Spike Geyser has a raised vent formed of deposited sinter, and is located right next to the creek. Six hundred feet further down the valley is another collection (the Fissure Group) either side of Witch Creek, and one part of the stream bank (on the south side) is covered by quite extensive streaked deposits and run-off channels as water flows from springs on the hillside above, similar to the patterns by the Firehole River below Grand Prismatic Spring. There are dozens of sulfurous pools and fumaroles nearby, centered on a large area of unstable ground. The path, which has been descending quite steeply down treeless slopes a little way to the north, crosses the stream shortly below this area, and continues on the south side of the valley, past a few more pools (the Middle Group), now rather more spread out. The path comes close to one such cluster of pools, then crosses a grassy plain, bends back towards the stream, climbs up the opposite hillside a way, through bushes and small trees, before dropping down gradually and passing along the edge of a sizeable section of whitish earth punctuated by small vents (the Eastern Group), none of which seem very interesting. 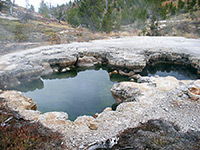 A more varied and colorful assortment of hot springs (the Western Group) is located on the far side of the valley, along a small stream, and 0.3 miles from the path. The final part of the trail is quite flat, crossing a marshy meadow and reaching the Heart Lake patrol cabin by the shore of the lake, where the route divides; right is to Mount Sheridan (4 miles) and the Snake River (9 miles), while the left branch (the Trail Creek Trail) leads to Yellowstone Lake after 11 miles. Heart Lake is big, surrounded by rounded hills covered with pine forest, and lined by a clean stony beach bearing large pieces of driftwood. It looks just like most other lakes in Yellowstone, in fact. Several campsites are dotted along the shore (no fires allowed), and visitor information is available from the patrol cabin when open, usually for just a few months in midsummer. The most distant part of Heart Lake Geyser Basin is 0.4 miles further down the trail (right branch) then 0.2 miles away from the path across a patch of marshy ground (see 360 degree panorama), at the edge of the Mount Sheridan foothills, and it contains the one big geyser in the valley, Rustic Geyser, which erupts quite regularly for about a minute, with intervals of between ten and 90 minutes, although at some times it is dormant for long periods. Its two satellite vents are also often active. 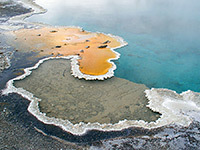 Nearby are a few large, hot, deep pools, one (189°F Columbia Spring) edged by very fine, delicate and undamaged sinter formations, and producing extensive run-off channels that are colored particularly bright shades of orange and yellow by the cyanobacteria that inhabit the thermal waters. Great care is needed if visiting this region, both for safety and to avoid breaking the formations. This is the best part of the basin, however, so it is well worth the time required to get here.